Smart watches have come to the attention of media since 2012. This trend was started when Pebble raised over US$10 million when it introduced its first ever smart watch for iOS and Android users. And right now, smart watch has become one of the hottest topics at this moment. It is estimated that 2014 will be the year when smart watches show up big at retail. Growth is expected to continue after that by selling millions of watches every year. So could there really be a market for wearable computing products like Smart watches? If people urge to use such products what is the necessity to have such ones? Nokia Asha Succeed As An On-Ramp To Windows Phone? Just like your smart phones, these smart watches are the wearable computers miniaturized in the form of wrist watch. You can do all the possible things that you do with your smart mobiles. 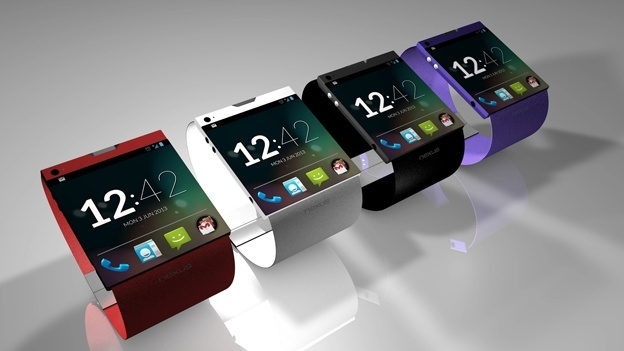 Some smart watches allow you to control music, read email alerts, and even answer phone calls. Since a smart watch connects to your smart phones, it can utilize the smart phone’s onboard sensor suite like GPS technology, accelerometers to provide users with variety of datas on the screen. For example, a recent sport app called Runkeeper has been designed to communicate with the Pebble’s Smart watch. With that app, you can keep track of your workouts by controlling them using the Pebble’s buttons. The technological development of smart phones which is so small yet powerful has lead to the revolution of these smart watches. Since these smart phone’s components are now small, energy efficient, the development of smart watches have become easy and cheap to fit into the reasonably sized watch. Thus, this has made people to access the computer wherever and whenever they are. Nonetheless, if you are being a fan of these smart watches, take a look on the list of Top 5 Smart watches in the market of 2013. As mentioned earlier, Pebble Smart watch had set a new record in the sales of the Smart watches and its popularity has not waned yet. This company was the first one to fire the imagination of Smart watch and thus continuously worked hard towards it. Now, it has got a considerable success and even more than that. But however, certain features like answering call, support for fitness apps and lot more must be improved to make this device to be a more successful one. Among all currently available watches, Martian smart watch is more elegant in look and style. Pebble watches work as a standalone device that functions in tandem with the user’s smart phone whereas Martial smart watch works just as an extension of the smart phones. These watches offer hands-free voice commands, alerting system, and smart phone camera control and can be used by the persons who do not wish to carry a full-fledged computer on their wrist. Apple iPhone 5S or 5C: Which one is best for you? This is watch is Italian made which looks great in style and design. But however, since the firmware and the software just feel unfinished, this watch could not catch up the first place in the top five smart watch lists. It is a simple, unpretentious and has few features. It is also designed to be an extension of wearer’s smart phones and does not replace it fully. This is the world’s first watch that combines analog movement with a digital display to keep people updated every second. This smart watch allows you to check what’s going on in your phone in real time even if you are not able to see your phone or reach it. This type of smart watch is for the users who wish to stick over with more operations than aesthetics. For such kind of users this watch is worth buying. It is least visually pleasing kind of watch than the other which are mentioned above. In addition to this, you must also make a note of Samsung’s smart watch called as Samsung Galaxy Gear. This smart watch can act as a smaller second screen when you feel that your phone is too big to use. It lets you to take calls, send messages and perform various other tasks from your wrist without touching your phone. The first true missile launched by Samsung in the field of wearable devices. The Samsung Galaxy Gear Smart Watch has a fantastic look coupled with a smart placement of camera, excellent speaker, microphone use, a 1.63 inch amoled colour screen to make video interactions very clear. In addition to this, it comes with 4 GB on-board memory, 90 apps supported platform, interacting right into the watch itself and numerous other features that has made this smart watch as a must-have device. So, it seems smart watches swooping from all directions and people are ready to welcome every kind of valuable innovations. Anyways, these smart watches must need to carve on its own to attract more people by improving its battery life, looking better than any normal wrist watch to make sure that the entire world exists on our hands. I found Samsung Galaxy Gear watch much smarter technology example then the rest. Next goes the iphone 5C smart watch. Samsung Galaxy Gear Watch is smarter than other watches. I prefer this to my readers. Anyway thanks for dropping your comment here. Keep Coming.